This month, FixMyStreet.com sent one more report off to a council. There was nothing to distinguish it from all the other reports of fly-tipping, potholes and graffiti… except that it was the one millionth to be sent since the site began. Back in 2007, when mySociety first launched FixMyStreet, we had a feeling it’d be useful — but we couldn’t have foreseen the take-up it’s had not only here in the UK, but across the world and in many forms. One million seems like a real milestone, so in celebration, here’s a whistle-stop tour of FixMyStreet’s life so far. The first report ever sent to a council through FixMyStreet was this one, concerning a broken streetlight. It was created by a mySociety staff member during beta testing of the site, and sent off to Oxford City Council — who fixed the streetlight. Proof of concept, and we were off. Once it was clear that everything was working smoothly, FixMyStreet had its official launch that March. Those who know and love FixMyStreet may be surprised to hear that in this first incarnation, it was given the slightly less snappy title of Neighbourhood Fix-It. Some might suggest that names have never been mySociety’s strong point. Personally I think we got much better at that later. Just a week after launch, users had already filed over 1,000 reports — a sign that there really was a need for this site. You don’t have to worry about which council is responsible for an issue: FixMyStreet just automatically sends it off to the right one. There are lots of reasons why you may not know where to send a street report, not least the UK’s two-tiered system of local authorities. We make the reporting process as simple as possible. It’s that whole ‘swans looking graceful but paddling like crazy under the waterline’ thing: we put in an awful amount of work to make sure that you don’t even notice the issues FixMyStreet has to deal with to make the user experience super-smooth. Back in 2012 we blogged about some of the thinking behind the site; for example here’s why FixMyStreet begins by asking just one simple question. By June we’d realised that Neighbourhood Fix-It wasn’t the snappiest of names, and thus was born FixMyStreet as we know and love it. In June 2008, Apple launched their app store. Our developers saw the future, it seems: by December that year, we’d launched a FixMyStreet app (NB, the links in that 2008 post don’t work any more: if you’d like current versions of the app, you’ll find them here for Apple and here for Android). The FixMyStreet apps have been downloaded more than 40,000 times, and we’re seeing a real growth in those who use it to make their reports: in the last year it accounted for 27% of reports. This reflects a general increase in the use of mobile (you can also use your mobile’s browser to access www.fixmystreet.com) — 55% of our visitors came via a phone or tablet in the last year. Like most mySociety software, the code that FixMyStreet runs on is Open Source: that means that anyone can pick it up for free, and run their own site on it. In March 2011, a group of coders in Norway were the very first to do this, with their version FiksGataMi (it means FixMyStreet in Norwegian. They could have gone for Nabolaget Fikser Det, which means Neighbourhood Fix-It, but, well, you know…). Since then, we’ve made real efforts to make the code easier for others to deploy, and ensured that the improvements we add to our own FixMyStreet are also available for all the others: just recently we rolled out version 2.1 of the codebase. Taking a peek to see what’s being reported around the world is one of our favourite, if non-standard, means of armchair travelling. 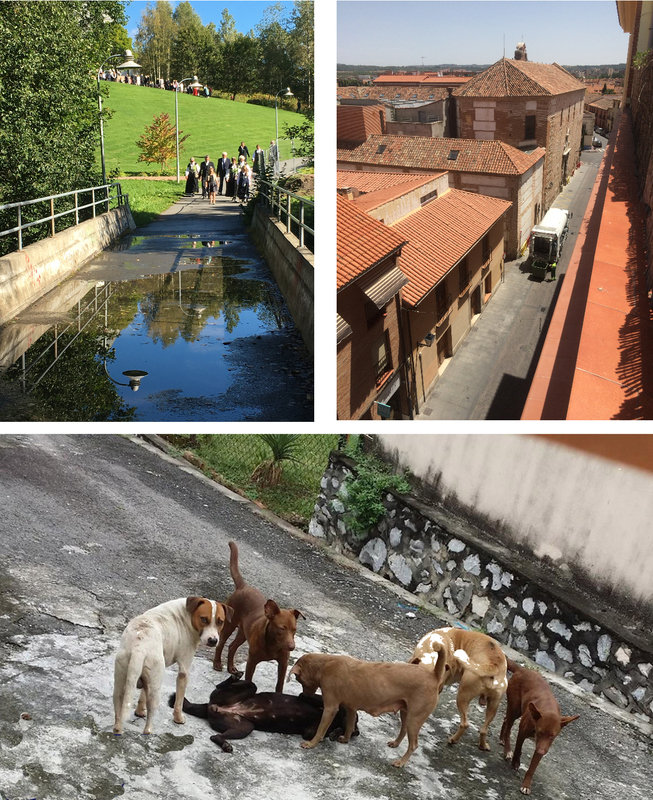 A Norwegian puddle-prone footbridge gets in the way of christenings, confirmations and school meetings; meanwhile in Spanish city Alcalá de Henares, a resident complains about the smell created by rubbish lorries while allowing us a splendid view across the rooftops; and in Malaysia, a pack of stray dogs is causing problems for one reporter. We’d wanted to provide a reporting system that bettered those offered by local councils: in June 2012 that goal was seemingly affirmed when some councils purchased the system to place on their own websites. We officially launched FixMyStreet for Councils, with Bromley and Barnet being the very first local authorities to implement it. Since then, we’ve been in a continual process of improvement, driven by input and collaboration with many councils around the country. Several more have become clients, too. We’ll have more news on the latest developments soon (and meanwhile, if you are from a council, you can learn more here). One of the nicest things about a codebase like FixMyStreet is that it can be deployed in many — sometimes surprising — ways. If you’ve followed our blog over the years, you’ll have seen the Channel 4 collaboration Empty Homes Spotter; the bicycle incident-reporting platform Collideoscope; and a project fighting corruption in Malaysia. There’s something about FixMyStreet that inspires some users to exercise their powers of descriptive prose: we celebrated many of them in this 2014 post. Then there are the reports which attract comments from other users. Lots of them, year in, year out. This one about seagulls in Brighton, for example, has become a one-stop forum for people all around the country to come together in their mutual despair of and/or love for our coastal avian friends. 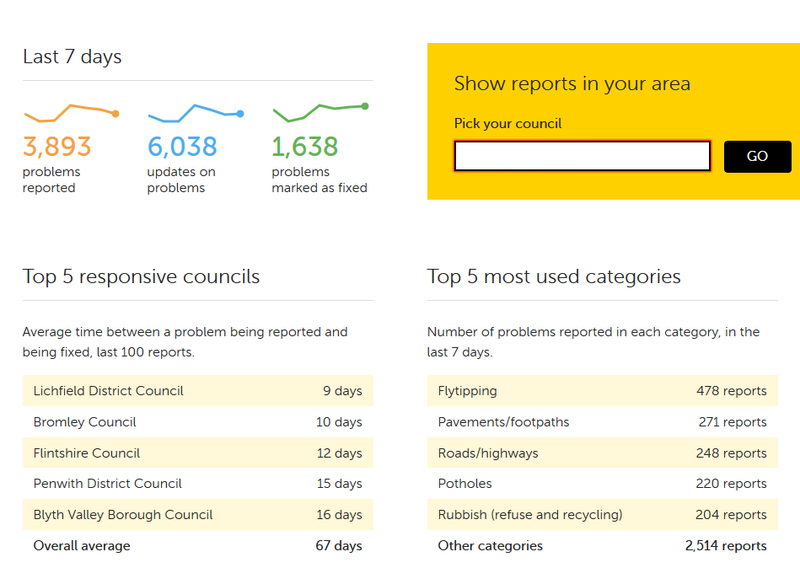 You can track the progress as we head towards the next million reports on our new stats page; where you might also be interested to see which councils are currently responding to issues most quickly, and what categories of problem are most-reported at any given time. As you can see, at the moment the site is handling around 4,000 reports a week: but you can expect that to rise when the weather gets colder — we always get a lot more pothole reports in the winter. And, are you wondering just what that millionth report was about? Nothing is ever simple: because some reports are made and then subsequently deleted at the user’s request, or because they contravene FixMyStreet’s house rules, we can’t just identify report number 1000000 as the millionth. Those deleted reports retain their original numbers, even though they’re not live. But doing a quick bit of calculation, we suspect that the rightful millionth report might be this utterly unremarkable one in Knowsley. Long live the unsensational reports that simply get things fixed.